Ioffe Institute. The main building. Ioffe Physical-Technical Institute of the Russian Academy of Sciences (for short, Ioffe Institute) is one of Russia's largest research centers specialized in physics and technology. 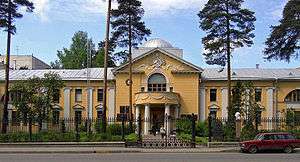 The institute was established in 1918 in Petrograd (St. Petersburg) and run for several decades by Abram Fedorovich Ioffe. The Institute is a member of the Russian Academy of Sciences.